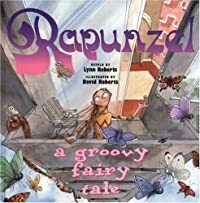 I was having a browse amongst the books in a nearby junkish sort of rake around barn, the sort of place where you have no idea what you might find, when I spotted a book called Rapunzel. Having had long hair for most of my life I’ve always felt an affinity with Rapunzel so I had to have a look at the book. It turns out that this one isn’t really for children at all, it’s aimed at people who were teenagers in the 1970s and the lovely illustrations are full of nostalgia – for me anyway. In this version Rapunzel has been locked up in the bedroom of the tower block that she lives in with her Aunt Edna. The lifts don’t work and Aunt Edna won’t use the stairs so she uses Rapuzel’s hair to get in and out. Of course one day a young man called Roger witnesses Aunt Edna shouting to Rapunzel to let down her hair. Roger is eager to find out who the beautiful red plait belongs to, so the next day he impersonates Aunt Edna’s voice and climbs up the plait himself to find Rapunzel, and so begins their romance. Rapuzel’s bedroom walls are covered with 1970s posters, ABBA, Kate Bush, Elton John, Marc Bolan and John Travolta. There’s even a Swiss Cheese plant and a lava lamp. Platform shoes and fringed waistcoats feature too. It’s a lovely blast from the past. You can see images of some of the illustrations here. Speaking of Gaberlunzie – back in the dim distant past when I worked in the local library, the folk duo Gaberlunzie was due to play a gig at the local community centre and the tickets were on sale at the library. We had all been told to expect members of the public to be coming in to buy tickets. This was the early 1970s and computers hadn’t arrived at the library, it was all cardboard tickets and card indexes, with everything filed in alphabetical order, I loved it, we were faster than computers. Readers often left their spare library tickets at the library for safe keeping, asking for them when they wanted to borrow something. We just needed their name and address, although most of the time we already knew it. Unfortunately, my friend was off the day we were told about the Gaberlunzie tickets, so when someone came in and asked her for tickets for Gaberlunzie – she immediately said – What’s the address? Which was followed by a blank look from the woman and gales of laughter from the rest of the library assistants. Ahh simple days, but Gaberlunzie still makes me think of that time. 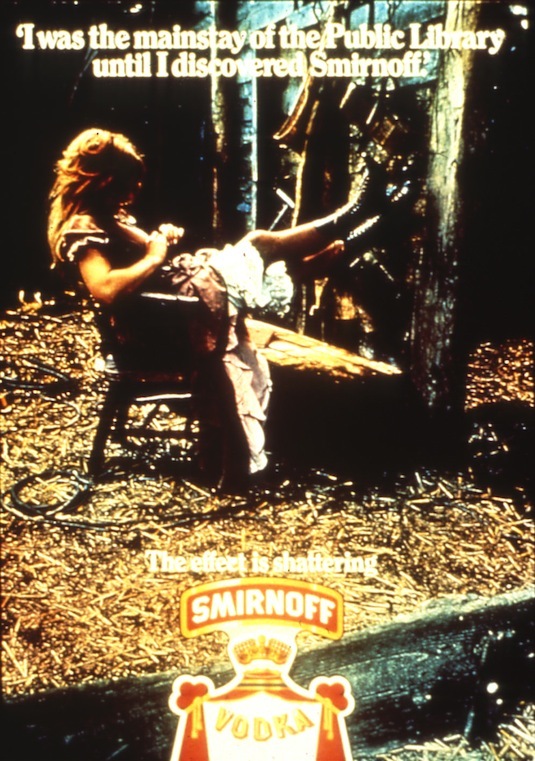 Something else which makes me nostalgic for those days at the library is this old Smirnoff advert, which apparently wasn’t a success, especially with potential librarians. But I love it, as well as the image, it just shrieks ‘1970s’ – which was supposedly a style-free zone, well so the kids of the 1980s claim. But for me it was a great time for fashion and design. What’s your favourite decade?